Enjoy the relaxation that comes along with the variety of nail services at Indulge Salon, York Pa on South George Street. 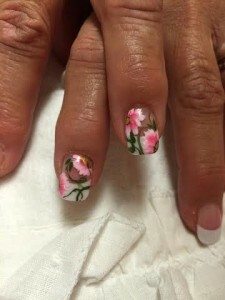 We have natural nail manicures, acrylic nails, silks, fiberglass, fills, gelish gels. Work with the specialists that will asses your nails and give you the shape that best suits your lifestyle and recommendations on the hottest new nail polish colors. If you haven’t ever tried Reflexology, this is the time to start. The many benefits of reflexology are to increase the circulation flow of blood by stimulating the nerve endings in the feet and the hands. This is a great way to indulge your feet and feel free to combine this with a pedicure. You will receive a wellness experience of total relaxation from head to toe. The bottoms of the feel are massaged in circular motions that are connected with different parts of the organs in the body stimulating them to stay rejuventated. While the feet are soaking in the pedicure spa bath, the hands are massaged and relaxed. The actual reflexology treatment will last 1 hour. If you decide to treat yourself with a pedicure this is included with treatment. Golfers will especially enjoy this tension release in the feet. Repair. Single nail repair. We will inspect the nails if you have never been to us before and assess damage, nail color, nail shape the desire results your looking for then we can determine which way to go. 10-15 minutes 3.00-5.00 If you need another nail color which would require us to repolish all of your nails we will charge 10.00 for the polish change. designs, beading, jewels, decals, jewelry, airbrushing. If you want specific artwork done send us a photo at Indulgesaloncustomerservice@gmail.com. We will need additional time for each finger and we need to schedule the appropriate amount of time. All of our work is customized. Hot Stone Therapy Pedicure. This treatment is delicious and relaxing. Experience the pleasure of a spa pedicure while your feet and legs are massaged with hot lava stones that keep the heat in longer. Organic Pedicure. This treatment includes an exfoliating oatmeal and honey hotmilk soak. It’s true a fabulous hotmilk is used that was used in the Egyptian days softens the skin to a silky feel. A honey scrub exfoliator plus oatmeal to cleanse the flaky skin will leave your skin so supple and soft. The enzymes in the milk and honey naturally purify the skin. Loaded with anti-oxidants and to top it off, we use our own Indulge Pure Originals Body lotions and creams to lock in the moisture. Spa Pedicure. The treatment concentrates on the removal of callouses and dry flaky skin. The eucalyptus mask is applied to your feet and wrapped in hot towels leaving your feet tingling and invigorated from the sensation! Classic Pedicure. A total experience that should be done routinely for the health and hygiene of the feet. Maintenance should be done every four weeks to really keep the toe nails trimmed at the correct length and the skin around being trimmed to prevent ingrown nails. Specialty Pedicures. All pedicures include soak, exfoliation, massage, trimming and filing, callous filing and finishing with base coat, color, and top coat.